"There was a cold November wind blowing through 116th Street." You're alone in an unfamiliar, grimy and bitter city, just looking for a place to spend the night. The Street by Ann Petry is a novel about a woman, Lutie Johnson, who finds herself in this situation. The relationship between Lutie Johnson and the urban. 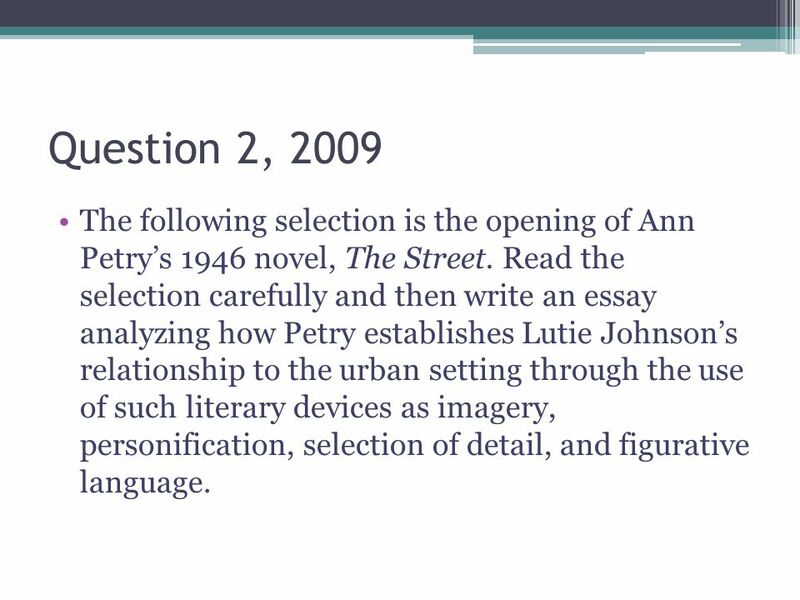 Students were asked to read carefully the opening passage from Ann Petry's novel The Street (1946) and then, in a well-organized essay, to analyze how Petry uses literary devices to establish the relationship between Lutie Johnson and the urban setting. In the prompt, imagery, personification, selection of detail; .